Right on the Walls sent me one their beautiful wall decals for review. I was not sure exactly where to put it because I wanted it in a place where we could see it all the time. I finally found the perfect spot next to my kitchen. 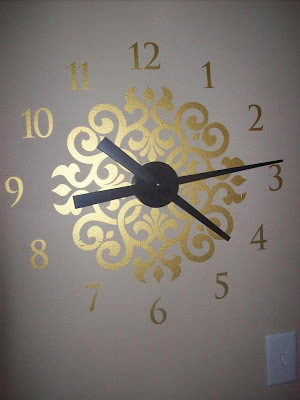 I chose the ornamental clock in metallic gold and am in love with it! It was a two person job to put it up though because with the numbers not being attached to the rest of the decal, you had to be very careful when pulling off the backing. My husband and I think that it is so cool and different to have a flat clock on the wall. I also love the swirly pattern and we have shower curtain that has a similar swirl. The company was generous to give all my readers a 15% off discount on their purchase when they use the code: BR15DCT. Another wall decal that I LOVE! GIVEAWAY!! 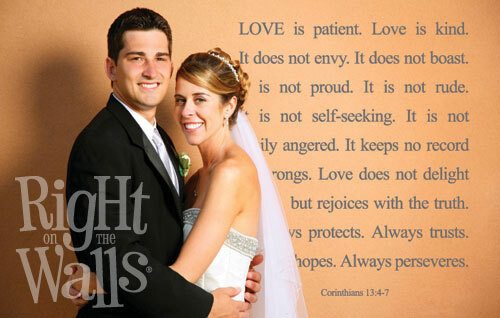 The people at Right on the Walls offered to give away a $40 gift certificate to the winner of the contest! The contest is open until midnight Tueday August 10th. The winner will be chosen on Wednesday August 11th via Random.org. Mandatory: Visit Right on the Walls and let me know which wall decal is your favorite. I would get the Custom Name Overlay for my son...cute! I subscribe to your site via RSS! I love the entryway one - "In Our Home Let Love Abide, And Bless All Those Who Step Inside"
I love the clock idea Amanda! So that is what I pick to - the one that you can customize though - Hanging Wrought Iron Clock With Name/Year love it!!! I love the Bird on a Branch. I like Right on the Walls on Facebook. I love the "Laughter Is The Music Of The Heart" decal. I found you after you commented on my blog :-). And I'm so impressed by all the posts you write! I looked through everything they have, and I'm still in love with the bird clock!! I love lov elove the family monogram stamp! One of my favourites is the Custom Kitchen Utensil Clock however I have always wanted a custom design of a quote special to my husband and I.
I am not sure how I found your site, possibly through a facebook posting or another blog. I am a facebook fan of Right On the Walls. I would want the chalkboard marquee - it would be really useful to have in the kitchen! My favorite is the birched trees and birds. I like right on the walls on fb. I already added you to my blogroll! I subscribe by email as well! I found your site after you commented on my blog! Glad to have found you! I posted a link on my blogs sidebar! I love the Outlined & Solid Polka Dots and Bamboo decals. Found your site through my comments. :) Thanks for stopping by! Thanks so much for your stopping by and saying hello! With Custom Carved Heart..super cute! My favorite is the "because I have a sister I always have a friend" decal. Perfect for my little girls room. Thanks! I would like "and the cow jumped over the moon" it's super cute and would go great in my sister's nursery! I love the customized cuckoo nest - super cute! I'd like to get the Custom "I Love You" Message one! I found you on tight wad in utah's giveaway list! My favorite wall decal is Floral Mix, I love the colors and how fun yet classy it is! I found you on Networking Witches Hump Day Link Up! I love the laundry today or naked tomorrow decal! Found site via tight wad in utah. I think the chalkboard pig sign is cute - never seen anything like that! I love the Bamboo Clock. I joined by email feed. I love the family monogram stamp. I like the "Fancy Family Names"! Thanks for doing the blog hop today. Great giveaways! Come and link-up at http://giveawaysandgoodies.com and I have some awesome deals at http://thefamilysaver.com. I've subscribed to your feed!! I like 'Bless this home with love and laughter'. I found you through One 2 Try's giveaway linky! I like the Custom Kitchen Utensil Clock. I found you on Fun Friday Blog Links! my favorite wall decal is the Because Every Picture Has A Story To Tell! Oh I love the hanging clock! So pretty! I love the hanging clothes pins for the laundry room! Adorable! Following you via google friends! I found you through my blog! :) And I am so glad I came to stop by! My favorite is the Western Skull. Thanks. This would be a good reminder in our house..also love their wall art for kid's rooms! nice clock, can u remove the wall sticker or wall decal if u want to replace it?